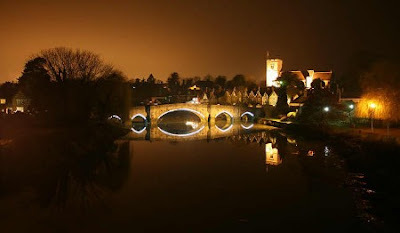 The campaign to illuminate Aylesford Bridge was down to the dedication, vision and hard work of three local people. Local Councillors John Balcombe, Brain Taylor and Dave Smith. Between them they raised the money from local business sponsorship (thank you Waitrose!) and overcame seemingly endless obstacles from both the contractors who installed the lighting and English Heritage who are responsible for the bridge. The reaction from villagers and visitors has been wholly supportive. An amazing achievement from three very dedicated people who deserve thanks and credit for their hard work.